If the strength of your windows against strong winds and flying debris concerns you, Carolina Solar Security can give you peace of mind. We offer safety window film with impact protection adhesive for maximum strength. We specify and install 3M window film and adhesives. 3M continually outperforms other brands, providing superior protection against inclement weather. As the global leader in adhesives with items likes Scotch Tape and Post-It notes, 3M positions itself as the top manufacturer of window film adhesives as well. When we combine 3M Safety Window Film with their Impact Protection Adhesive, the result is a window with maximum protection. Carolina Solar Security installs Safety Window Film with Impact Protection Adhesive for both residential and commercial clients. After a thorough cleaning of the window and application of the window film, the installer administers the Impact Protection Adhesive. Curing time depends on temperature and relative humidity. Avoid cleaning the window or adhesive system for at least 36 hours after installment. You should allow 7 days for the window film and adhesive to fully set. 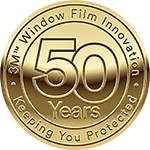 While Safety Window Films with Impact Protection adhesive greatly improves the strength of windows, it does not guarantee that the glass will not break or become detached. It simply provides a necessary precaution, similar to wearing a seatbelt while driving a car. The seatbelt doesn’t guarantee against tragedy, but it does greatly increase the chances of survival in the event of an accident. When you install Safety Window Film with Impact Protection Adhesive in your home or commercial space, it’s like wearing a protective seatbelt while you’re working, playing, eating, and sleeping. Carolina Solar Security is a Prestige Authorized 3M™ Dealer in Wilmington, NC. We have been providing Southeastern North Carolina with window tinting solutions like safety window film with impact protection adhesive since 1985 and never stop working to bring our customers the best products paired with the most skilled window film technicians. Reach out to us for your free quote today!